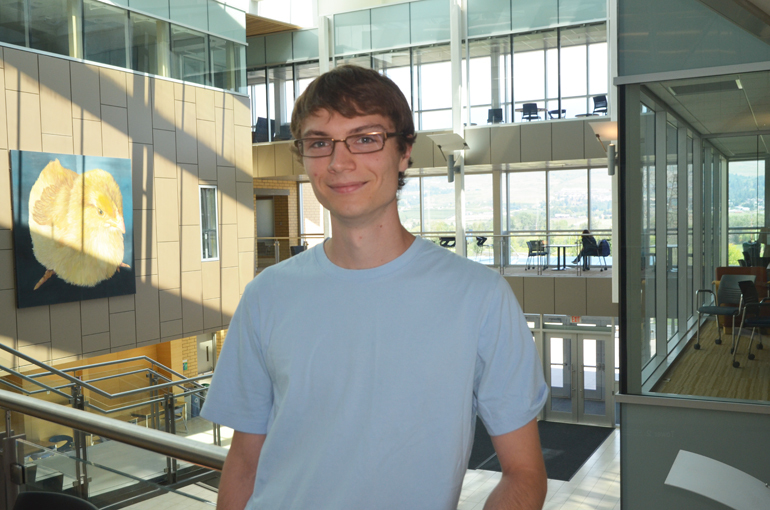 Yasha Pushak, winner of the 2015 $10,000 Pushor Mitchell Gold Medal Leadership Prize. Few students publish scientific research as undergrads – and fewer yet are tapped as lead authors by their profs. But double-honours computer science and math student Yasha Pushak, winner of the 2015 $10,000 Pushor Mitchell Gold Medal Leadership Prize, found himself in that rarefied air. Pushak spent two summers working as an undergraduate research assistant, and co-authored four publications during his four years at UBC Okanagan. His first paper, which he worked on with his professors and thesis supervisors, Warren Hare (mathematics) and Yves Lucet (computer science) was submitted to the European Journal of Operations Research, one of the top journals in its field. It is only the latest accolade for Pushak, graduating Friday at UBC’s 2015 Spring Convocation. He has garnered more than 10 scholarships and awards as a student in the Irving K. Barber School of Arts and Sciences. In addition to being a stellar scholar and prolific researcher, Pushak has been instrumental in promoting the work of math and computer science undergraduates, connecting students and building relationships. Pushak participated in the Canadian Undergraduate Mathematics Conference, and was so enthusiastic about it that when he learned no such event existed in computer science, he decided to organize the very first Canadian Undergraduate Computer Science Conference (CUCSC) at UBC Okanagan. Acting Dean Barbara Rutherford calls Pushak a rising star, whose time spent as a teaching assistant, tutor and organizer will have a lasting impact on future students. Mark Baron, managing partner at Pushor Mitchell LLP, says that Pushak is a worthy recipient of the award, which the firm created to recognize students who excel academically and also demonstrate leadership in community service or volunteerism, cross-cultural relations, promotion of diversity, intellectual pursuits, and artistic or athletic endeavours. Pushak moves to UBC Vancouver this fall to begin a graduate degree, majoring in computer science with a focus on mathematics. He has received several entrance scholarships and awards. The Pushor Mitchell LLP Gold Medal Leadership Prize is a $10,000 prize offered by Pushor Mitchell LLP to a graduating student in the Irving K. Barber School of Arts and Sciences at UBC’s Okanagan campus. In addition to academic achievement in the student’s final fifty-four credits, candidates for the award must demonstrate leadership in one or more of the following areas: community service or volunteerism, cross-cultural relations, promotion of diversity, intellectual pursuits, and artistic or athletic endeavours. The prize is awarded based on the recommendation of the Irving K. Barber School of Arts and Sciences.